Wednesday has been a difficult day for the country with explosive, suspicious devices being sent to CNN, former Attorney General Eric Holder, Democratic Congresswoman Maxine Waters (CA), plus former Presidents Bill Clinton and Barack Obama. Put simply, it’s inexcusable and unacceptable for that to happen to anyone in this country. 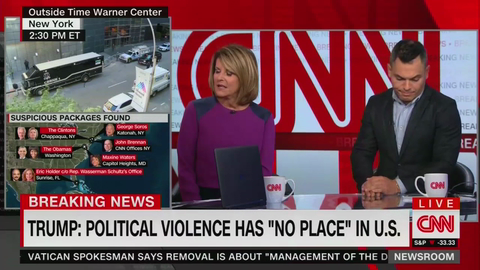 Reacting to President Trump’s comments on the bombs, CNN Newsroom’s panel of analysts, journalists, and pundits promptly lashed out at Trump, insinuating his guilt and deeming his remarks insufficient.